Beware of the mammoth! Yes, a mammoth is at large somewhere amidst the fountains, the promenades, the pavilions in Parc de la Ciutadella, Barcelona. Don't say I didn't warn you when you step on the glade and there's no one but you and the beast. Luckily I had time to fire the flash of my camera and sneaked away in the bush. You may not be that fortunate. 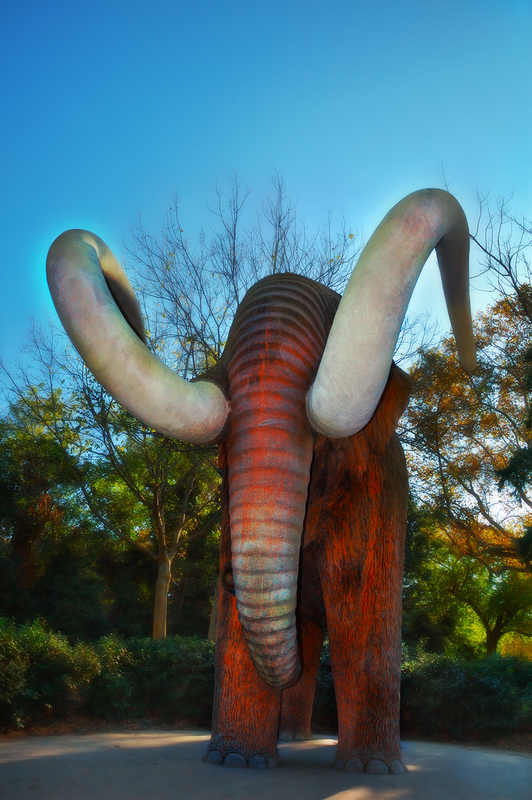 Now being a little more serious, let me tell you that this stone mammoth was built based upon a model by sculptor Miquel Dalmau and as part of an initiative of Norbert Font i Sagué (1874-1910), writer, geologist and renown speleologist. Thanks to Norbert Font speleology was first introduced in Catalonia. Wow, that was a very lucky escape! Esta buenisima. Que bella imagen. Looks very big. Nice colors. Love this picture! Is Barcelona decorated for Christmas? And everyone thinks that ice age is over! Your work seems better than ever! It's a while since I visited but just this first look is kind of stunning me. wow that's huge - awesome!